Mermaids on Parade - Go on a Mermaid Scavenger Hunt! Look below for a free, interactive map for your Mermaids on Parade hunt! Hunting for Mermaids is one of our favorite free things to do for a cheap weekend getaway in the Virginia Beach area. Whenever we're in Norfolk, our kids say "Let's hunt for mermaids!" Whether we look for them casually as we're driving around, or go on a serious scavenger hunt using the map (see below), it's a makes for an enjoyable day...and it costs nothing! A mermaids scavenger hunt is fun and free! Obviously, I'm not talking about "real" mermaids here. 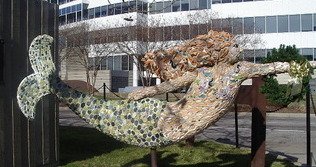 "Mermaids on Parade" is a collection of mermaid sculptures throughout the city of Norfolk. And they're everywhere! The sculptures--representing Norfolk's official symbol--appear on street corners, storefronts, and parks throughout the city. They're similar to the cow sculptures that used to grace Prime Outlets Williamsburg. But unlike the cows, which were eventually moved on to another location, they're here to stay. All are designed and decorated by local artists. 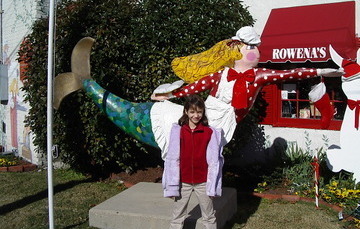 Many have themes that go along with their location-- like the "Baker Mermaid" outside Rowena's Tea Room, which stands by the entrance, beckoning you to sample the delicious poundcakes, jams, lemon curd, and teas inside. There are 130 mermaids in all! Some of the sculptures are done in mosaics, others in bright jewel-like crystals. Some reflect the theme of the group sponsoring them, like the one painted in tiger strips at the Virginia Zoo. How many sculptures are there in all? Last count: 130. So we defy you to find them all. We haven't yet! How do you find them? Well, you can do things the old fashioned way--just drive around and look for them (the way we do it). But an official Mermaids on Parade map would be much better. Here it the interactive map. See how many you can find! Here's an idea: split into two cars, set an allotted amount of time (say 30 minutes or an hour), and do a race to see how many mermaids each team can find. Just remember to obey the speed limit! 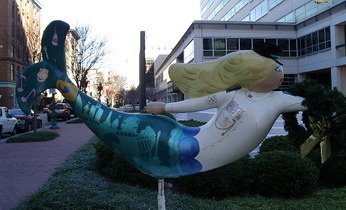 Want to learn more about the Norfolk mermaids? The short story is that Mermaids on Parade was the brainchild of Norfolk attorney Pete Decker back in 1999. He sprang the idea of "the most spectacular gathering of mermaids ever seen in the United States" as a way to benefit the local arts scene. Local business leaders "bought" the sculptures for $2000 apiece and the money was shared among local charities. If you go the official website you can buy jewelry, gifts, cards, ornamental flags, and more, all featuring Norfolk's famous symbol. So go out and have a great scavenger hunt! Looking for More Free or Cheap Things to Do? Free museums. Kids eat free deals. Discount amusement park tickets. Who wouldn't want these deals? I've got 'em all on one spot for you in my Cheap Family Vacation Hall of Fame!